Click here to watch the video of the lucky draw! 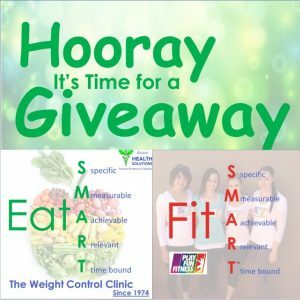 The winner will receive the following: OUR SUCCESSFUL EatSMART GUIDE AND FitSMART PROGRAM WORTH R2000. Take yourself from flabbiness to fabulous in only 12 weeks! EatSMART GUIDE: user-friendly and simple to follow. This guide will make your fat loss journey to a healthy body weight not only easy, but achievable. The EatSMART Guide includes The Weight Control Clinic (since 1974) eating plans with dietary guidelines, incl. lists of food choices, meal plans, health tips and links to relevant articles. BONUS: links to quick, easy and delicious legit recipes. Written by Dr Arien van der Merwe & Anri. FitSMART EXERCISE PROGRAM (FITin15 12-week body challenge): designed for fat loss and muscle toning with effective workouts of only 15 minutes each, in the comfort of your own home. No equipment needed with beginner, intermediate and advanced options. All workouts are fun and differs to avoid boredom. You will also receive two email consultations with our health & fitness scientist (Anri van Rooyen) for support, motivation and to address questions you might have.